Strip-cut mobile shredder features optimized cutting device technology that destroys 40 to 42 sheets of paper, creating 38 strip-cut particles per page. It also shreds staples, paper clips, credit/store cards and CDs/DVDs. High-quality materials provide safety and durability. Automatic paper feed with overload protection reduces paper jams. Continuous-duty operation ensures continual shredding with no downtime. Energy Management Control System EcoSmart allows particularly low power consumption of 0.1 watts in standby mode. Quiet operation minimizes noise development in the workplace. Cutting rollers are made of hardened solid steel. 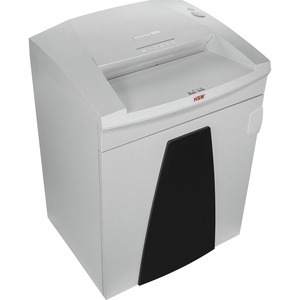 With a Comprehensive Safety System, shredder is UL Approved and CE-Certified. Design also includes inspection window to monitor filling level; multifunction element for intuitive operation; and light barrier for automatic start/stop.